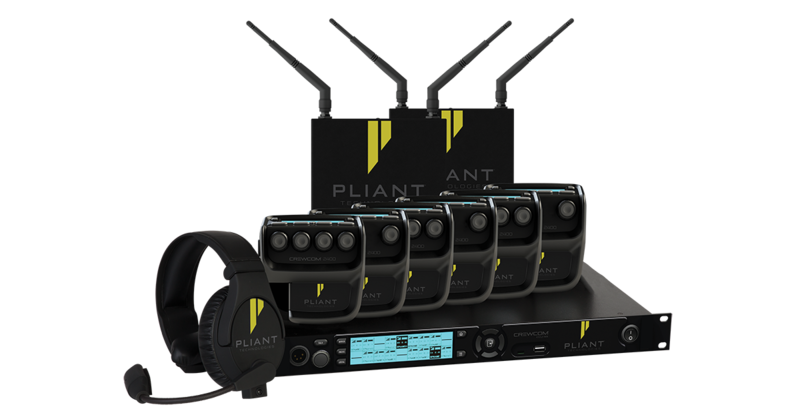 The system features excellent voice quality, the industry’s smallest fully-featured professional full-duplex wireless radio packs as well as a host of truly amazing user features. With CrewCom, production crews large or small can now easily and quickly deploy communication solutions to connect more people in more places than ever before. CrewCom is an entirely new, innovative approach to professional wireless intercoms, designed to handle almost any application from simple out-of-the-box solutions to large-scale designs for live-sound, broadcast and industrial environments. CrewCom meets the needs of the sparse frequency spectrum for wireless microphones, IEM and intercoms. With 50 channels per base station, 1024 conferences, simple multi-zone roaming and a standard connection for wired intercom systems, CrewCom is a great solution for theatres, TV studios, event communication and rental companies. As from now, CrewCom is available at FACE for Belgium and Luxembourg. Our audio experts will be present at ISE and are looking forward to demo the CrewCom products. The CrewCom Radio Pack is a highly advanced and innovative design using the latest technology to offer a digital wireless beltpack used for connecting mobile users to the CrewCom system. Along with full-duplex multi-conference communications, the Radio Pack combines flexible conference access and customizable controls for a highly functional, yet familiar user experience. The CrewCom® Radio Transceiver puts RF specifically where needed. It houses a radio with corresponding antennas and serves as an access point, enabling RF communications with CrewCom Radio Packs. Using CrewNet as a backbone, a large number of RTs can easily be positioned on the network over a wide coverage area through direct connection to a Control Unit or Hub(s), or through daisy-chain configuration with each other. The CrewCom® Audio Expansion Unit is a device with 2-Wire and 4-Wire ports to enable extended connectivity with industry-familiar external intercom devices. Discover CrewCom at ISE. Contact our audio experts to get a demo.